With todays ‘always connected’ approach to technology, the biggest threat to your organisations data is that of virus or malware infestation. These types of problems are increasing daily and at an alarming rate. Protection from this ever growing and changing threat is critical to the continued success of your business. Can you afford not to be protected? At Pure IT we ensure that your business is protected against all threats by providing a complete, managed set of security products. We call this PureIT Protect. With PureIT Protect you get a complete service which provides ‘best in class’ protection against current and emerging threats. 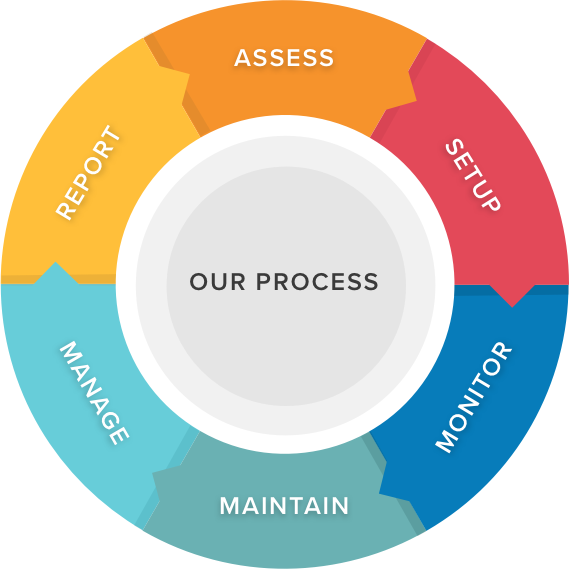 As this service is completely managed by us we constantly monitor your IT infrastructure and respond quickly to any issues. Managed Anti-Virus protection – Centralised deployment and management of industry-leading Anti-Virus software. Email Anti-virus protection and SPAM filtering – Scan all inbound emails for Virus and Spam content. Protects your systems from email-borne viruses. Web Security – Centralised control and management of web browsing activity. Helps protect traffic from phishing and malware sites plus provides granular control over website visits. We setup everything you need to protect your business data. One of your most important business asset is data. After all, without customer information, order details or product data, you would not be able to perform ANY business activities. Can you imagine partially or even completely losing your business data? It could mean the beginning of the end. At the very least, it would damage your company image and cause you needless stress. PureIT Backup is a reliable, fully managed service providing backup monitoring, management and administration, so you can focus on running your business with complete peace of mind that your system and data is protected. We take care of the complete setup and everything you need to protect your business data. Backups are made automatically through a schedule and fully monitored by us. We monitor and manage the backup of your data and regularly test to ensure that your most important asset can be recovered should disaster strike. Your data is securely stored both on-site and in the cloud, so it is continuous, directly available to you and only you. You can keep a history of your file changes depending on your retention preferences. Changed files are stored as a new version; this allows you to go back weeks to restore the desired version. With our great value fixed monthly cost, you can rest assured that your data is secure and protected without unforeseen charges.